At Lemon Tree Bed & Breakfast we work with local Artists to bring you an exclusive, yet affordable selection of mementos to bring back home after your stay. Louis Briffa (born March 7, 1973) is a Maltese glass artist. Briffa is also a former qualified primary school class teacher. Briffa has been working in glass since 1997. His main areas are leadlights, 3d glass sculptures and mosaics. The artist creates his own designs and patterns for every piece of work, making the end product truly unique and distinct. Being the glass industry in Malta nearly inexistent and as a consequence the range of coloured glass very reductive, Briffa decided to start importing art glass from the US in 1999. This enabled him to satisfy his quest for colour and artistic fulfilment. The artist has produced restorations and reconstruction on the glass windows at the Our Lady of Damascus church in Valletta, adjacent to the Grandmaster’s palace. Besides he worked on various religious and non, commissioned work. Briffa likes to create mosaics depicting local scenes and other subjects. The artist is very passionate about the work he is focussed on at any given time and struggles to achieve not only the visible artistic level, but also tries to instil a kind of spiritual vibe in the artistic piece. The artist feels alive as long as he is allured by the desire to satisfy his artistic quench. At the age of 28, Mallia who was a student of the late Esprit Barthet, already held his first solo exhibition at the Museum of Fine Arts in Valletta. This exhibition led him to winning a bursary at the Academy of Fine Arts in Florence which has helped him develop his style further. Although travelling to countries like France and the US led him to slightly abandoning his art for the hedonist lifestyle, it also led to some of his greatest experiences. In France, he worked for Pathe, a major film production and distribution company, as a storyboarder and photographer. It was here that Princess Stephanie of Monaco recognised his talent and commissioned him an exhibition which turned out to be a complete sell out. The French audience related to his distinctive style in painting the characters he met but that didn’t stop trying elsewhere and that’s when he went on to exhibit in Miami and Toronto. It was after his arrival in Malta though that he realised the need to pursue his career as an artist, full time. 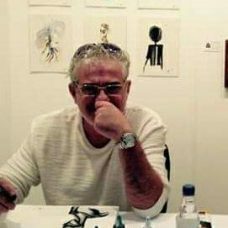 Although Mallia is marketed as a European pop artist, he is definitely an expressionist, openly critical of the system where artists sacrifice their individual authenticity to adapt to conservatism and where art has only been of interest to the pretentious and over-privileged, high culture.